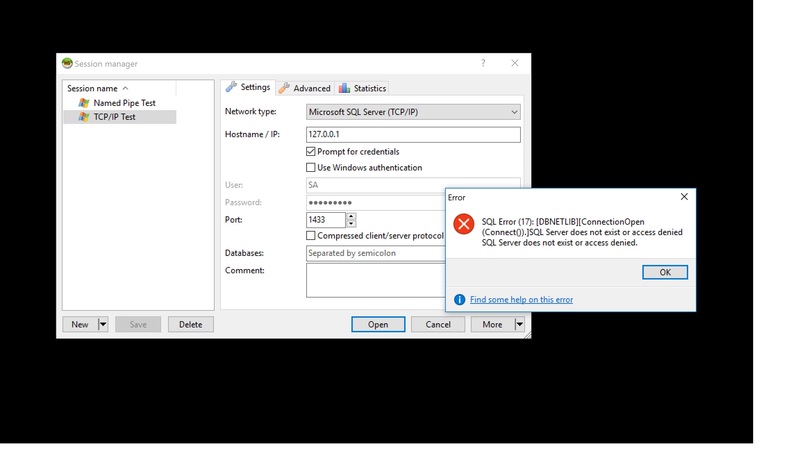 I'm trying to connect to MSSQL Server with TCP/IP and keep getting SQL ERROR (17) - it can't find the DB or User/PW if no good. But I can connect with Named Pipes using the same User ID & PW. I've checked the protocols in SQL Server Configuration Manager/SQL Server Network Configuration and IP4 (127.0.0.1) is enabled. I've tried dynamic ports/no dynamic ports, setting the port to 1433/leaving it blank, and all combinations. 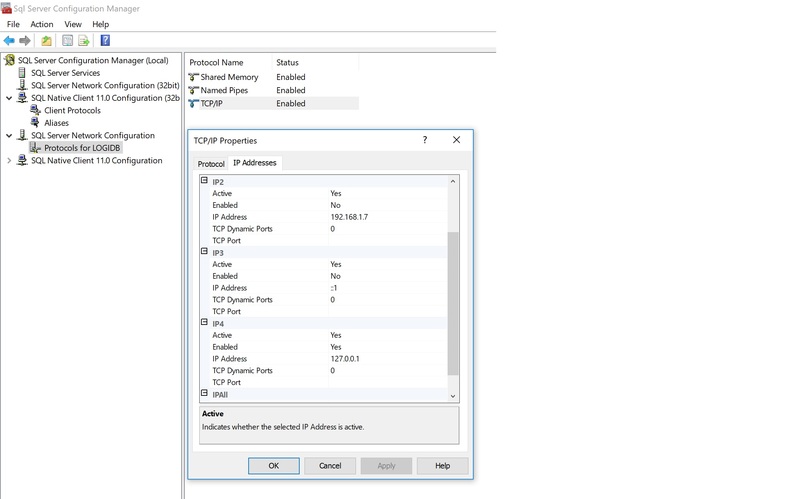 Any help would be greatly appreciated as that once this I get this test working locally I need to connect to an MSSQL server through the internet and thus need the TCP/IP connectivity. Can you connect through SQL Server Management Studio? How's the exact error message? I suppose you need to compare the port number and user/password then. Again, how's the exact error message? Press Ctrl/C in the error popup. Or make a screenshot if you can't copy it. The Crtl/C worked (I should remember that for other programs' error popups that I could never C&P with the mouse.) Thanx. SQL Error (17): [DBNETLIB][ConnectionOpen (Connect()). ]SQL Server does not exist or access denied SQL Server does not exist or access denied. Ok, this gets confusing here. Now you get an error with a named pipe connection? Your first post says TCP/IP is not connecting, but named pipe works? I'm having similar problems running in Wine. SQL Error (6): [DBNETLIB][ConnectionOpen (Connect()). ]Specified SQL Server not found Specified SQL Server not found. The connection settings are correct. Typo on my part - not part of the C&P. I have named the two connections "Named Pipe Test" and "TCP/IP Test" and I guess I just typed the first one in as the description without thinking. Also, Session Manager, aka the program, sits there with the circle spinning for a while if I move the mouse pointer over the window (if I click anywhere inside the window while the circle is spinning it hangs and says "Session manager (Not Responding)" then in both cases the error message appears. [Content] SQL Error (17): [DBNETLIB][ConnectionOpen (Connect()). ]SQL Server does not exist or access denied SQL Server does not exist or access denied. I can’t expand the window to show them all - But IP1 appears to be the mac address of my nic and is Active but not Enabled and IPALL just has 62222 by "TCP Dynamic Ports" and nothing beside "TCP Port." This is such a nice information. It really works for me. So what are you doing that I am not?